Often we think of adding color (“painting or pigments”) as the only means of creating color but thanks to the neverending spectrum of light, which contains all colors, nature chose to employ nanotubes to create new colors where there were no pigments to be found. I know this sounds a bit crazy. I swear I haven’t been drinking (it’s too early). 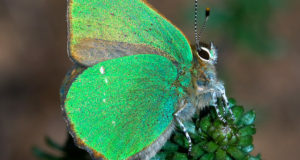 Scientist have found that some bugs, like this green hairstreak butterfly actually use gyroid nanotubes to trap and redirect light, causing some of the spectrum to cancel itself out. As you can imagine, when certain spectrums of light cancel, you are left with the rest. In this case, green. What the heck is gyroid? Gyroid structures within butterfly wings are chiral periodic structures with a cubic symmetry. 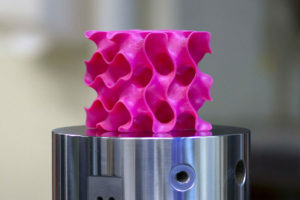 They are the subject of rapidly increasing interest in photonics, with applications from photonic crystals (PCs) and metamaterials to optical materials with topological complexity, owing to their unique geometrical properties. The strong chirality phenomenon of gyroid structures results in the ability to manipulate optical circular dichroism and has even been used as a new miniature chiral beam splitter. Gyroid structures have also been predicted to exhibit frequency-isolated Weyl points with gapless surface dispersions and line nodes, similar to Dirac points in two-dimensional periodic systems. Boiled down, these structures, created by Nature, have the ability to act as optical filters by causing certain frequencies of light to cancel out within the structure thereby only reflecting certain wavelengths and creating color by removing color.